Aircast Cryo/Cuff For Back/Hip/Rib with Cooler (Non-Motorized Kit),Designed to give maximum relief from swelling, inflammation, pain and swollen joints. Cooling effect helps ease the pain.Fast Shipping! Aircast back/Rib/Hip Cryo/Cuffs are designed to give maximum relief from swelling, inflammation, pain and swollen joints. Cooling effect helps ease the pain. The design allows maximum coverage of the affected area for better treatment and can be used on Hip, Back or Ribs. It comes with a cooler and a cuff. Cryo/Cuffs can be ordered alone or with a cooler. The cooler can also be purchased as a separate assembly and can be used with any Cryo/Cuff model. Aircast Back/Hip/Rib Cryo/Cuff W/Coolr by DJO Canada is designed specifically for Back, Hip and Rib injuries. Used to decrease swelling and pain following the injury. Most of the athletes use this following hip, back or rib injury. Easy to use at home to get rid of muscle and back strain. 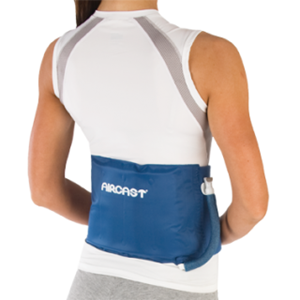 Aircast Back/Hip/Rib Cryo/Cuff with cooler is a device that circulates cold water to provide cold therapy to the users suffering from injuries. One size fits most of the users. Size is Universal that fits all. I had such an issue with my back and my physio recommended me to use aircast cyro product. It was too expensive to buy it, and then I found this site amazing prices! I bought this product after my back surgery. It worked pretty well. You can also notice decrease in swelling when you start using it. Would definitely recommend it to those in need. Best place to shop online. The product was exactly the same as it was described on the site. I had some queries regarding the product and its shipping. I wanted to clarify all the queries before ordering the product. I am thankful to the helpful staff who reverted on all my queries and also helped in prompt shipping of the product. My experience of shopping is great. Looking forward to buy more from you guys.